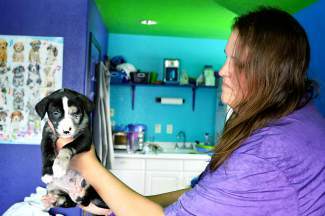 Becky Knight, a volunteer with the Hope for Animals rescue, is fostering the litter at her dog wash and grooming business in DIllon. 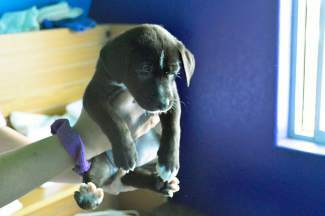 One of the puppies, "Princess Leia," will be up for adoption at the end of January. Hope for Animals is hosting a chili fundraiser on Saturday, Jan. 16 to help cover the cost of veterinary bills and transportation. 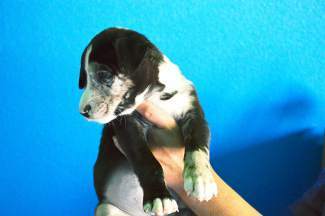 "Luke Skywalker" will also be up for adoption. Two of the puppies, named "Storm" and "Trooper," have distinctive marking on their faces. 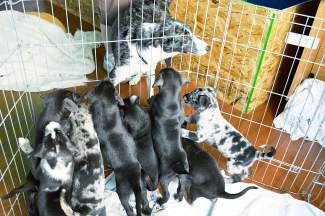 The "baker's dozen" of puppies are well-socialized, with frequent visitors and volunteers. 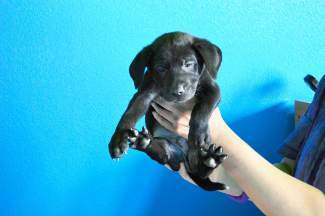 The mother, Lucy, was rescued from a shelter in Amarillo, Texas. A volunteer plays with the puppies just before mealtime. Becky Knight is fostering 13 puppies at her Dillon business, all named after Star Wars characters. 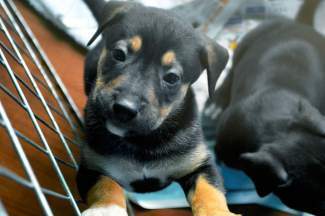 The six-week-old puppies will be up for adoption by Jan. 30. "Boba Fett," a six-week-old rescue puppy, will be up for adoption on Jan. 30. Yoda is the smallest pup of the litter, named after the original Star Wars series. When: Jan. 16, 2015 from 11 a.m. to 3 p.m.
Yoda whined, while Luke, Darth and Han Solo scuffled in a game of tug-of-war. 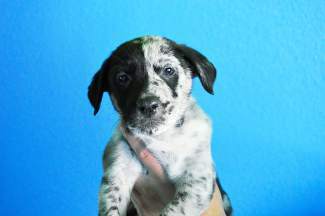 The four puppies are just a few of the baker’s dozen up for adoption from a local rescue. Named after characters in a galaxy far, far away, the 13 dogs are residing in Becky Knight’s business until they can be taken home. A volunteer with the Hope For Animals Rescue, she took in a pregnant dog from a shelter in Texas, resulting in a plethora of puppies. A rescuer by heart, Knight’s Dillon dog-grooming business, Healthy Pet Haven, is decorated with photos of past rescues. 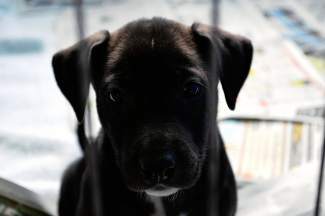 A small rescue stretching from Summit to Clear Creek County, Hope For Animals brings in dogs from shelters across the state, Kansas and Texas, finding foster families until they are adopted. The mother, Lucy, was on a kill list at a shelter in Amarillo, Texas before she was tagged to be transferred to the rescue. 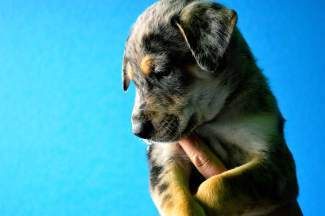 A Catahoula Leopard dog and Border Collie mix, Lucy was taken in by a foster family, when they suspected she was pregnant. 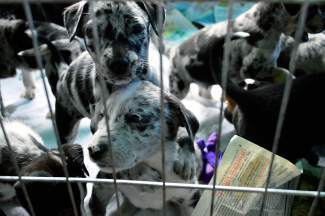 Sure enough, a veterinarian counted a dozen puppies — the 13th was a surprise. With no one wanting to take in a dog and puppies, Knight gave them a new hope, offering a space at her business until they are adopted. After Lucy gave birth, Knight and her husband, a Star Wars fan, stayed up late coming up with fitting names for each pup. 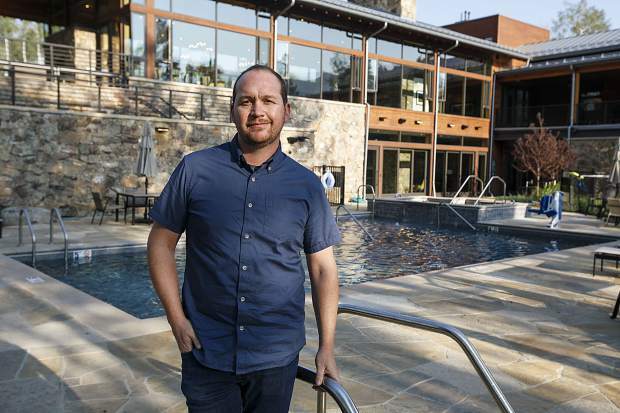 The largest of the litter — Jabba the Hutt — already has a home. At six weeks old, the puppies have two more weeks before they can be taken home. 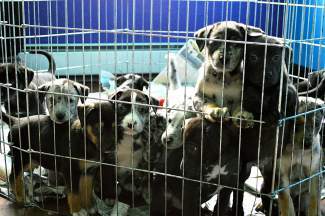 While a few have already been claimed, there are still several that will up for adoption on Jan. 30. With visitors and volunteers stopping in frequently to help care for the puppies, none of them are shy. 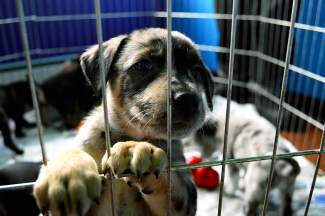 With the new baker’s dozen of puppies, the rescue will host a chili fundraiser on Saturday, Jan. 16. Chili donated from local restaurants will be available from 11 a.m. to 3 p.m. at Healthy Pet Haven at the cost of a donation, and Lucy and her puppies will also be there. The self-service pet wash will also be open. She hopes to raise $500, to help cover veterinarian bills from the past year, including for spaying and neutering rescues as well as treating cases ranging from ticks or worms to more serious conditions such as mange or distemper. 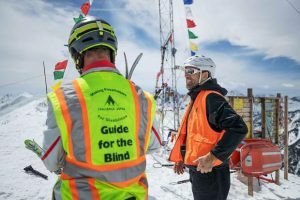 While each dog must have a health inspection before crossing the Colorado state line, the rescue will give animals additional treatment as needed. She said most puppies find a home in a matter of weeks. 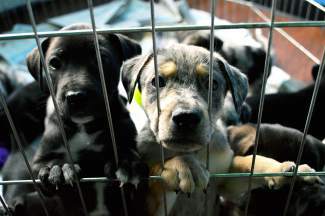 To adopt a dog, applicants need to fill out a form and go through a phone interview to ensure they are a good fit. They may also do a home visit with the new pet prior to adoption.